100% Editable one-page Physical Science interactive notebook input notes! Are you looking for an editable version of my INB input notes? Then this product is for you! This product includes editable word documents of the input notes included in my Physical Science interactive notebook units. You can use this product to easily edit content in the notes of my individual Physical Science INB Units. Do NOT purchase this product if you have already purchased an Interactive Notebook OR Curriculum Bundle. These notes are included in bundled products such as the Physical Science Differentiated INB Bundle, Upper Elementary Physical Science INB Bundle, Intermediate Physical Science INB Bundle and Physical Science Curriculum Bundle. 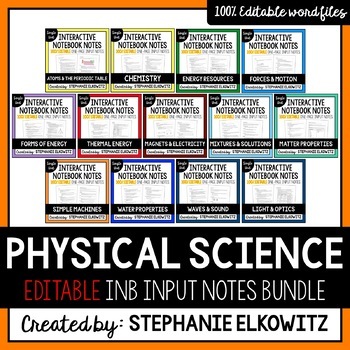 Editable notes for individual Physical Science INB units are NOT for sale. Chapter 1: What is Force? Chapter 1: What is a Magnet? Chapter 1: What is Matter? Chapter 1: What is a mixture? The input notes are saved as .docx files. The fonts are safe for use with Microsoft Office Word and come with most Microsoft Office versions.